The Post Home is located at 2907 West Third Street in Chester's West End. 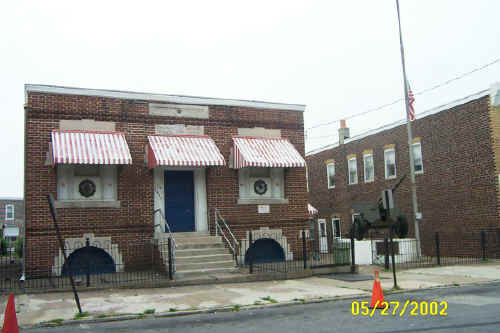 The Post was chartered by the American Legion on April 14, 1934. The Post was named after Walter Szymanski and Warren Rywacki. They were two Polish-American servicemen who were natives of Chester. Warren Rywacki was a member of Co. C, 111th Infantry, 28th Division and was killed in the Battle of Fimes on August 28, 1918. He is buried in Flanders Field, Belgium. The Post is still an active Post in the American Legion and carries on work in helping veterans in Delaware County as well as hospitalized veterans at the Coatesville VA Hospital and the VA Hospital in Elsmere, DE. Meetings are generally held at 7 PM on the second Friday of each month (during the winter the meetings are held at 2 PM on the second Sunday of the month). © 2000, 2002, 2004 John A. Bullock III.